The 20-year-old has shown no sign of being affected by the speculation and netted his seventh goal in 15 Motherwell games this year during a 3-1 defeat by Aberdeen in midweek. Robinson is unfazed by the prospect of putting Hastie in against Rangers at Fir Park today. “He was only linked by you guys,” Robinson told a media conference. “Apparently he signed three weeks ago and now he’s not signed. “I don’t need to speak to Jake. If Jake is tired after three games in a week, he won’t play. If he’s going to contribute to Motherwell winning a football match, like every other player, then they’ll play. Other players have been linked with other clubs so it’s certainly not just Jake Hastie. I’m sure plenty of people will be coming to watch our players again. 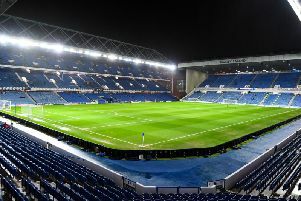 Motherwell drew 3-3 with Rangers at Fir Park in their fourth league game of the season before having Carl McHugh sent off in a 7-1 defeat at Ibrox.